Carte de la Coste d'Arabie, Mer Rouge, et Golfe de Perse,... - Bellin, J. N.
Title : Carte de la Coste d'Arabie, Mer Rouge, et Golfe de Perse,... . Size : 8.7 x 9.8 inches. / 22.0 x 25.0 cm. Description :Nice small map focusing on the Red Sea, also covering coastal areas around the Arabian Peninsula and the Persian Gulf. 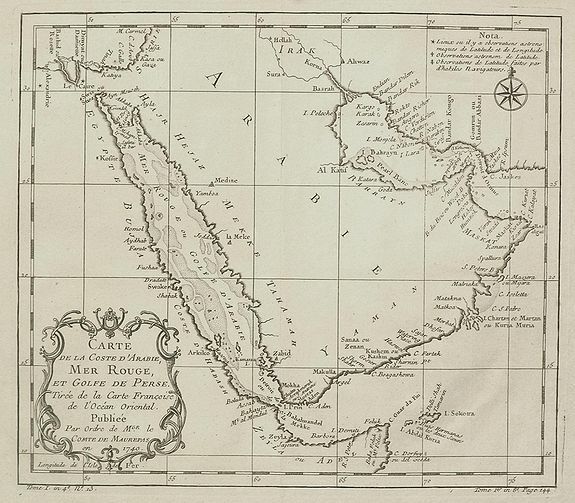 Jacques Bellin was Hydrographer in the French Dépôt de la Marine; with access to the latest navigational reports, he produced a great many maps and charts of excellent quality. Here, despite the small-scale, we see good detail of islands and shoals along the coasts. In the best tradition of scientific cartography, Bellin notes the methods by which several locations on the map have been ascertained, whether by astronomical or other, less accurate observations.